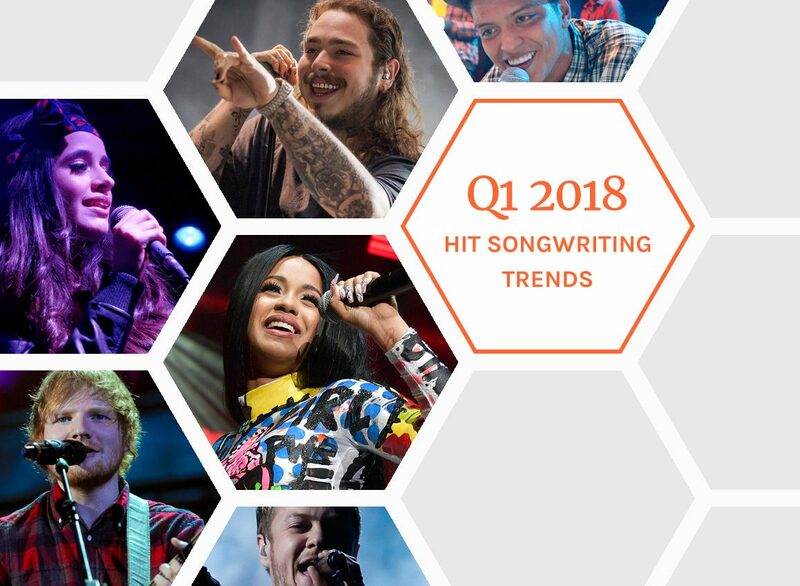 Hit Songs Deconstructed recently released its Q1 Quarterly Trend Report, which details the compositional and industry trends for the Billboard Hot 100 Top 10. To download a PDF with highlights from the Quarterly Trend Report, click here. In Q1, there were 26 songs in the Top 10 of the Billboard Hot 100 Top 10, three of which charted at #1 during the quarter – God’s Plan, Havana and Perfect. Hip Hop’s prominence reached new heights in Q1 both as a primary genre and as an influence. As a primary genre it increased from 32% of songs in Q4 up to 46% in Q1, surpassing Pop which dropped to just 23% of songs. As an influence shaping the sound and vibe of songs both within and outside of the Hip Hop/Rap primary genre, it was featured in 85% of all Top 10 hits, including two-thirds of Pop songs. Rock and Latin dropped off the map in Q1, while Dance/Club/Electronic and Country made a return, the latter thanks to the Bebe Rexha / Florida Georgia Line collaboration, Meant To Be. And the once popular Tropical influence dropped to its lowest level of prominence since Q2 2015, playing a role in just 4% of songs. Men once again dominated the Top 10, with 54% of all hits featuring exclusively male lead vocals, compared to only 19% that feature exclusively female vocals. However, some of the quarter’s biggest hits feature a female lead, including Bodak Yellow (Cardi B), Havana (Camila Cabello), and Perfect (Beyonce’s feature alongside Ed Sheeran helped launch the song to #1). Approximately half of Q1 hits feature multiple lead vocalists and a combination of sung and rapped vocals, the latter being the most popular for the third straight quarter. There was less love and not a lot of hooking up or partying going on in Q1, and minor keys once again shaped the vibe of the majority of songs. First choruses averaged on the earlier end of the spectrum thanks especially to the Hip Hop genre, and post choruses were the least popular they’ve been in years. Spotify Playlist with the 26 Songs that Charted in the Billboard Hot 100 Top 10 in Q1 2018.